Construction on the first space-bound Orion Multi-Purpose Crew Module began with the first weld at the Michoud Assembly Facility on Sept. 9. 2011. This capsule will be used during Orion's first test flight in space. NASA has kicked off construction of the first space-bound version of its next-generation deep space vehicle, a capsule designed to carry astronauts to an asteroid or Mars. On Friday (Sept. 9), engineers at NASA's Michoud Assembly Facility in New Orleans completed the first welds on the spacecraft, which is called the Orion Multi-Purpose Crew Vehicle (MPCV). The capsule under construction will be the first space-tested version of the MPCV, officials said. "This marks a major milestone in NASA's ambitious plans to send humans farther into space than the nation has ever been before," NASA spokesman David Weaver said in a statement. "We're not only working to send people into deep space, we are putting people to work right here in America." The gumdrop-shaped MPCV is based on capsule designs originally drawn up for NASA's Orion spacecraft, which was part of the agency's now-defunct Constellation program to return astronauts to the moon by the 2020s. Lockheed Martin Corporation, NASA's prime contractor for Orion, is modifying the original capsule design to meet the new requirements of a vehicle capable of flying astronauts on long-duration missions to deep space destinations. NASA and Lockheed officials have built several mock-ups and test versions of Orion for ground and splashdown tests, as well as for an emergency escape system test last year. But the new space capsule being built is the first one that will fly in space, NASA officials said. 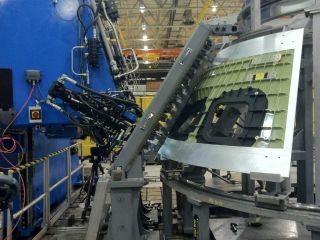 The first welds on the new Orion MPCV capsule were completed using a new friction stir welding process developed especially for MPCV construction, agency officials said. The new method creates a seamless bond stronger than any that can be achieved using conventional welding processes, they added. MPCV testing has been ramping up lately. This summer, engineers at Lockheed Martin have been subjecting another prototype MPCV to a series of ground tests, checking out its strength and structural integrity. The MPCV is designed to launch aboard a NASA heavy-lift rocket called the Space Launch System, which is still under development. But NASA officials have said they may use other rockets for MPCV test flights. After the welding is finished at Michoud, the MPCV will be shipped to NASA's Kennedy Space Center in Florida. At Kennedy, the capsule's heat shield will be installed, and the vehicle will undergo final assembly and checkout operations for its first orbital test flight, officials said. They did not state when that flight would take place.